"Given both sides are depleted, the team that plays with more desire and bravery should win. Mourinho’s pre-implosion makes it well worth backing Leicester." The opening game of the 2018/19 Premier League season has arrived far too soon after the World Cup, a fact made evident by the long list of absentees. Claude Puel has ruled out Harry Maguire and Jamie Vardy, while a mix of injuries and fatigue has left Jose Mourinho without Paul Pogba, Romelu Lukaku, Marouane Fellaini, Jesse Lingard, Anthony Martial, Eric Bailly, Antonio Valencia, Nemanja Matic, and Ashley Young. Mourinho's constant whinging will perhaps be greeted more sympathetically when the team sheets come out on Friday, although his negativity and criticism of his own players hands Leicester a psychological advantage. Tactically, Mourinho's side have looked extremely flat in pre-season, managing just one shot on target against Bayern Munich on Sunday. This should make it easy for Puel's compact, deep-lying defence to frustrate the hosts. At the other end, disorganisation and low morale means Leicester can win the 50-50s and, more importantly, counter-attack effectively via newcomer James Maddison. The former Norwich attacker is an outstanding signing; his dead-ball delivery and dribbling in tight spaces will hurt Fred, while Marc Albrighton's crosses from the left are a cause for concern up against Matteo Darmian. Given both sides are depleted, the team that plays with more desire and bravery should win. Mourinho's pre-implosion makes it well worth backing the visitors to avoid defeat on the Double Chance. The last thing Chelsea need right now, at the beginning of a dramatic transition towards high-line possession football, is to face the team that finished top of the table last season for tackles (19.6 per game) and second for interceptions (13.7 per game). Huddersfield Town will probably struggle to survive this year, but David Wagner's aggressive gegenpressing and complex positional organisation could unsettle Maurizio Sarri's timid midfield. Huddersfield opened the 2017/18 campaign with a 3-0 victory against Crystal Palace, a club also beginning to move towards high-pressing possession football under Frank de Boer. Sarri's team are considerably better than Palace but the comparisons are alarming from a Chelsea perspective. Wagner has had a whole summer to reassert his shape and get the players back up to full fitness; not unlike Leicester at Old Trafford, this could be another case of organisation and hunger winning out. 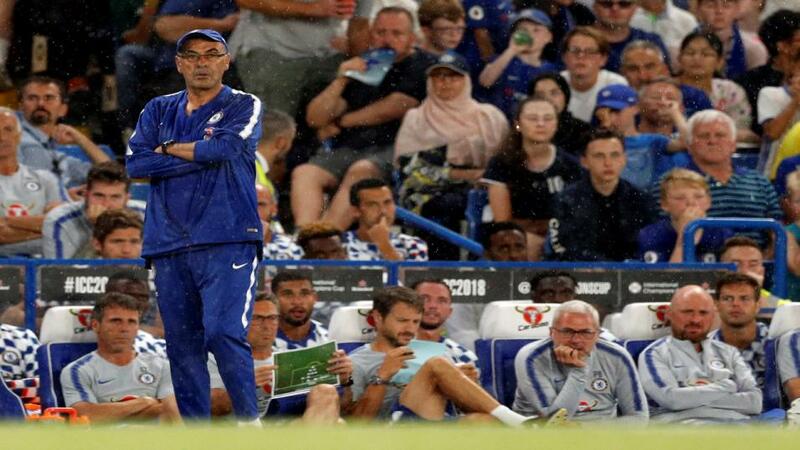 Jorginho looked understandably a little overawed on his English football debut last weekend, while Sarri's attempts to push the team up left big gaps between the lines of midfield and defence. Learning to play an expansive and brave style of football takes time Chelsea simply don't have. Manchester City easily passes through the middle, Bernardo Silva in particular comfortably finding room behind Jorginho. Huddersfield's counter-press can produce similar results at the Kirklees, particularly if Sarri picks the same shaky centre-back pair of Antonio Rudiger and David Luiz. Neither Liverpool nor West Ham suffer from major injuries or post-World Cup fatigue heading into this one, which leaves Jurgen Klopp's team the heavy favourites to collect three points at Anfield. The excitement surrounding the arrival of Fabinho and Naby Keita is justified, giving Liverpool a powerful midfield that will surely breeze through West Ham's soft centre. Pedro Obiang has been poor throughout pre-season having clearly been distracted by Sampdoria's interest, which gives Manuel Pellegrini a big problem. His 4-1-4-1 relies upon a combative defensive midfielder, but the Hammers simply don't have one. Mark Noble and Jack Wilshere are too leggy and prosaic to function together, allowing Liverpool to play sharply through the middle of the pitch. Klopp's gegen-pressing tends to focus down the middle, relying on biting challenges in central midfield for a quick release to that impressive front three. Keita and Fabinho have been handed a comfortable start to life in English football here, facing one of the softest midfields in the division. Liverpool should win at a canter. Manchester City looked entirely at ease at Wembley on Sunday, highlighting their strength before the season kicks off and the importance of shape over individuality in Pep Guardiola's system; they will control possession on Sunday and no doubt pick holes in a new-look Arsenal defence still learning Unai Emery's methods. What's more, Bernardo Silva is likely to dominate central attacking midfield up against a Premier League debutant in Lucas Torreira. However, Emery's tactics are well suited to playing on the back foot. He preaches patience, a compressed overall team shape, and rapid-fire counter-attacks that catch opponents playing with a high defensive line. For clues as to how the Gunners will play this season we must look back to his time at Sevilla rather than Paris Saint-Germain. Benjamin Mendy was superb going forward against Chelsea in the Community Shield but he may over-commit to attack, especially during this settling-in period. The spaces behind the Frenchman will be targeted by Emery: Pierre-Emerick Aubameyang and Alexandre Lacazette will charge down the right whenever possible, stretching the game at just the right moments to punish any slackness in the City back line. The visitors are rightly favourites, but we should see both teams create plenty of chances.